Practitioners can now focus their training on any one of the eight martial art styles taught in Oom Yung Doe. Forms combine controlled soft and hard movements; develops flexibility, coordination, strength, and speed. Movement becomes instinctive. Offensive and defensive movements are straight, but curves in all different directions and degrees, using more circles than angles. 6 month training programs are available for students who wish to specialize in one style. 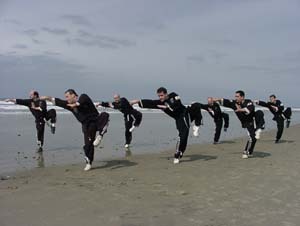 Instructors can achieve a master level in one or more of the eight martial arts. Many higher level Oom Yung Doe practitioners (Head International Instructors and Assistant Head International Instructors) have achieved a master level in at least 3 to 5 martial arts. To be recognized as an Oom Yung Doe master, one must attain a master level in all 8 martial arts. Only a Grandmaster of all 8 martial arts is capable of teaching someone to reach a master level. Grandmaster “Iron” Kim is one of the very few, elite practitioners who has ever achieved a master level in 8 complete martial arts throughout the world. What you have achieved is shown by your ability. Your actual ability represents your true condition. Your condition determines the quality of your life, how much your life has improved. Throughout history Traditional Moo Doe, true martial arts, has constantly been the target of jealousy and rumors – “The higher the mountain, the stronger the wind”. Traditional Moo Doe has always followed the time proven principle – judge based on what you see. Traditional masters and grandmasters have dedicated their lives to preserve the strength of Traditional Moo Doe. Any martial arts school that has true ability does not have to talk about how good they are, they can show it. Some are swayed by what they hear. Foolishly, they lose their chance to change their condition and improve their life. Remember, life is only once. Do not waste your life.